Learning Upgrade offers a comprehensive, personalized, and engaging learning experience solution through its online reading and math-related courses. Quality and Effectiveness: Learning Upgrade delivers a solid product, designed to aid fundamental math and reading skills. The content of the courses emphasizes K-8 standards, but the structure of the lessons also allows for them to be effectively used with struggling students for remediation. The lessons demonstrate key concepts through the use of animated cartoons and music, while developing student understanding through game-based activities. Each course moves linearly through the Common Core-aligned content, providing both students and teachers with formative and summative assessments to monitor progress and understanding. Ease of Use: Both teacher and student experiences are simple and easy to navigate. Instructions are delivered in multiple engaging mediums. Navigation through the courses is easy to understand for the student. Learning Upgrade does a great job in laying out the goals for the students as they work towards completion of the material. Creative Use of Technology: Learning Upgrade’s demonstration of content through multiple mediums garners student attention through every step of the lesson. Interactive whiteboard technology is utilized in the Teacher Whiteboard Lessons. The use of musical instructions, interactive games, and animated corrections works seamlessly, and the student experience feels more like a video game than anything else. Suitability for Use in a School Environment: Learning Upgrade’s services are completely Web-based, providing tremendous flexibility to schools as they implement the platform in their buildings. Teachers have easy access to not only student data, but also the ability to enroll students in courses and monitor their progress. Teacher Whiteboard Courses allow Learning Upgrade’s lessons to be taught in a group format, which is ideal for younger students or as a modeling tool before implementation. 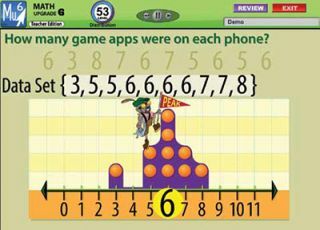 • The program’s Web-based service provides ease of access to both student and teacher and lowers the cost of rollout. • The lessons are engaging for students of varying ages and abilities, which allows for a wide implementation in any school or district. • The program is extremely easy to use. Neither the student nor the teacher will struggle with understanding the course content or goals. OVERALL RATING: Learning Upgrade is an extremely flexible platform, which can be delivered in either group or individual formats, and implemented as either supplementary instruction or used as the primary instruction in remedial courses.